Jason Manuel, superintendent of Germantown Municipal Schools, answers a question during a panel at the Signal Mountain Town Hall gym Monday, Dec. 4, 2017 in Signal Mountain, Tenn. Two superintendents and a general counsel from two of the Memphis area municipal school districts were in attendance to share their perspectives regarding separating from the Shelby County School System and their insights on operating as municipal school districts since 2013. 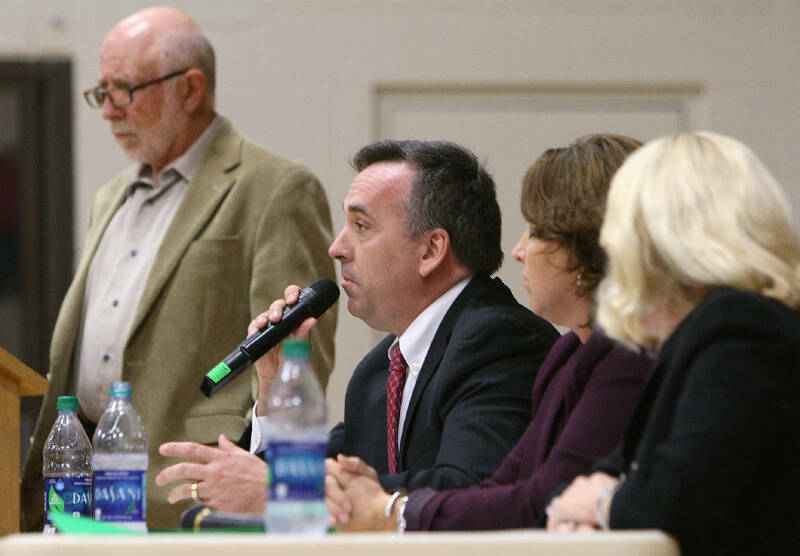 Superintendents from school districts in Shelby County, Tenn., weighed in on Signal Mountain's possible breakaway from Hamilton County Schools at a community forum Monday night. The Signal Mountain Town Council, which has been investigating the idea of creating Signal's own school district, invited representatives from Germantown Municipal School District and Arlington Community Schools in West Tennessee near Memphis to sit on a panel, answering questions and sharing their district's experiences with Signal Mountain community members and stakeholders. Germantown and Arlington representatives spoke favorably of the effects on the districts the municipalities built from the ground up three years ago. Germantown's property values and population have increased, said Superintendent Jason Manuel, and hundreds of applications from outside of the district to attend Arlington schools have to be denied because of a lack of space, Superintendent Tammy Mason added. "I'm excited because of what we've experienced," Manuel said. "For us, it's been an incredible experience for most of the municipalities." Since February, a seven-member committee has been exploring whether or not Signal Mountain can break away from Hamilton County Schools, creating a separate district. Those in favor argue the move would give Signal residents more autonomy and localized control over the schools. Representatives from the Shelby County districts made clear that localized control was one of the driving forces — and benefits — of their breakaway from Shelby County. "I was actually someone who believed at one time that we were better off being one school system," Valerie Speakman, attorney for Arlington Community Schools, said. "Now, I'm seeing what happens in a school system that is closer to the people I think that school systems need to be closer to the people, they run better." In June, Signal Mountain Mayor Chris Howley and the committee formed to investigate the viability of launching a separate school district, traveled to Shelby County and met with five of the superintendents of the municipalities near Memphis that left the county in 2014, including some of the panelists Monday. The six municipalities in Shelby County started their own districts after the Memphis school district merged with Shelby County Schools in one of the largest school mergers in the nation's history in 2013. The merger was the catalyst for communities to start their own school districts as parents grew concerned over the quality of their schools and worries of a lack of representation in the countywide school district that now serves more than 100,000 students. "Our school board wanted it to be a district that served students not only from Arlington, but also students from the surrounding communities," said Mason, superintendent of Arlington's 2,600-plus student district. But Shelby's situation might differ from that of Hamilton County's because no one fought against the split. "I think this was a really different situation for us than what you all are facing in that no one was opposed," Manuel said. Though some in the community, including even some Hamilton County school board members, have yet to take a stance on whether or not Signal Mountain should break away, last month the district did firmly say it would not give the school buildings to Signal Mountain. At Monday night's meeting, there also was a noticeable lack of representatives of Shelby County itself, despite audience questions on how the split has affected county schools and students not a part of the six municipalities. "The purpose of me being here is not to encourage you to do this or not to do this. This is the decision solely of your community," Mason said in response to an audience question directed at the visiting representatives' motive for supporting Signal Mountain's split. "We were invited here to share our story." Representatives from Germantown and Arlington professed that there is no data to support a negative effect from the split on Shelby County, however one national report released earlier this year by EdBuild, a nonprofit research group, shows persistent inequalities in Shelby County due to the split. Some within Hamilton County worry that if Signal Mountain breaks away from the district, it will similarly tip the scales. A separate Signal Mountain district would include three of the county's top-performing schools — Signal Mountain Middle/High, Thrasher Elementary and Nolan Elementary, as well as a less diverse student body than what is reflected in other parts of Hamilton County. 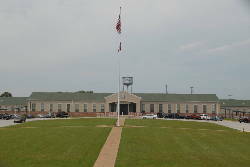 In October, the committee released its final report, with all but one committee member in agreement, ultimately concluding that a separate school district would be viable so long as the town was able to overcome three obstacles — control of the three school buildings, inclusion of Walden and other nearby unincorporated Hamilton County populations and how the town of Signal Mountain itself would be required to contribute to the school district. The Signal Mountain Town Council, which has faced some criticism of a lack of transparency and public input since the process started to move ahead a year, discussed next steps and proposed amendments to the original proposed budget for the potential school district at last week's meeting. It agreed to hold further discussion, including public comment on the issue, at its next meeting on Monday, Dec. 11.